Home » blu-ray , DVD , movies , watchmen » WATCHMEN: THE ULTIMATE CUT streeting on November 3rd! WATCHMEN: THE ULTIMATE CUT streeting on November 3rd! 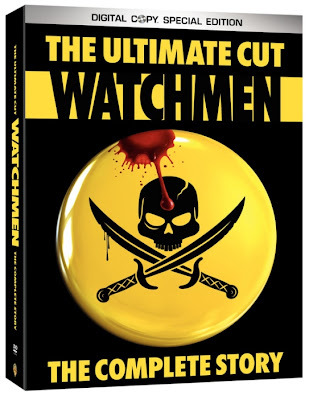 Remember: this is the cut that is going to incorporate the "Tales of the Black Freighter" animated material (which saw a separate DVD/Blu-ray release at the time the film premiered) within the Watchmen movie itself! I am very stoked about seeing how this is going to play out 'cuz if you've read the book you know how the comic book that young Bernard is reading parallels with the main story. The theatrical release was pretty faithful to the graphic novel (read my review here), the Director's Cut was even better (here's my take on that one) and the Ultimate Cut might be the best of the lot. This is really sad Chris I have not seen this movie yet. I want to see it so freakin bad right now.